It’s Happy Week here at WMBriggs.com: seven full days1 bursting with smiles, bonhomie, and the unadulterated love of my fellow man, no matter how wicked—but no! Joy begins as of now. So, without more and further ado—at last, at last!—some news worth cheering. 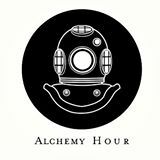 Announcing the brilliant opening of Alchemy Hour, Clothiers to the Stars! in Maplewood, New Jersey. The store was built and is owned and run by my Number One son (same first name as his old man, who in turn had the same first name of his old man, who in turn, etc., for many generations) and his lovely wife Julia. Now you know Yours Truly. But unless you are one of the half-million (plus or minus, give or take) who have read Mine Tomorrow: Polon Percival and the Political Ploy, you won’t know my son. Where his old man is industrial grade vinegar, Number One is cherry blossom honey. Organic, naturally. And if his father’s muscular mix of English-Austrian (German)-Irish-Polish blood gave him the love of endless argument, an infusion of a Dutch-Danish corpuscle cocktail produced mellowness and jollity itself in his offspring. In other words, don’t hold me against him. Julia sings opera and knows a good half dozen languages and has exquisite taste in clothing. You know how seriously we take clothing here, so I mean this as high praise. For instance, do not do this; at least, not anywhere within eyeshot of me. I’ve seen, many times, Julia suggest an outfit to someone who would look at it and say, “No way.” Until the someone put it on and realize it was perfect. Plus, the shop has many unique items from south of the equator. Julia is from Brazil and makes trips there to bring back exotic stock. She also has lined up several super secret sources of seamstresses who make their own wares. You won’t be able to find at Macy’s what you can discover at Alchemy Hour. Stop by when you’re in town and let Julia fix you up with something unexpected and astonishing. You can follow them on Twitter (@shopalchemyhour) or on Facebook. 1Somebody count and see how long I last. Baker Street has always been a respectable literary address. But now I’ve changed the odds. Best of luck to your #1 son. I would pop in for to browse, alas his location is 3,000 miles away.